Fall is here, and with the way time flies, winter is right around the corner. Experts are predicting a colder than usual winter here in Georgia this year and into 2018, meaning that those with a fireplace are likely to use this special feature of their home frequently. Before lighting your fireplace, it is very important to know that your chimney is stable and sound. 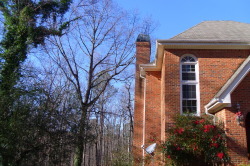 Anglin’s Foundation & Masonry Repairs is the expert in Georgia for chimney inspections, repairs, and restorations. We have been serving Georgia for 87 years, and we have built our reputation on quality and our company’s guarantee. A fireplace is a definite selling feature of a home for many people. Nothing says cozy more than curling up with a blanket in front of a fire on a cold day. To ensure that your experience stays cozy and safe, you need to be confident that your chimney is safe. Most homes that are purchased with a chimney will go through an inspection. This typical inspection often only looks for obvious external signs of damage such as a leaning chimney or one that is pulling away from the home. Yet, Anglin’s Foundation & Masonry Repairs knows that there is much more involved in a chimney inspection than just giving it the “once over” from the exterior. Anglin’s Foundation & Masonry Repairs has built our name and our reputation on honest service. We provide free chimney inspections and free quotes on the cost to repair chimney problems. Our company provides a Three Level chimney inspection to look for defects in construction and/or internal flaws or damage that have compromised the stability of your chimney. With 87 years of experience under our hard hats, we know what a thorough inspection involves. Whether you are purchasing a new home or you wish to have your current home’s chimney inspected, please contact Anglin’s Foundation & Masonry Repairs today. We are here to help ensure that your home is secure and worth its value.